Mansion Of Madness 2nd edition: Horrific Journeys Complete inventory list. 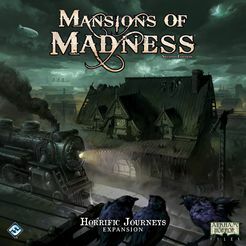 This post contains advertising links which are marked with a * Complete inventory list for MoM 2nd Edition: Expansion Horrific Journeys The Horrific Journeys component list is a continuation of the list i made for the Core game of Mansion of Madness 2nd edition. As I felt i could not do the one without the other. So hopefully this will be just as big a success as the core game post. Mansion of Madness 2nd Edition: Recurring Nightmares and surpressed Memories list of Investigators. Mansion Of Madness 2nd edition: sanctum of twillight Complete inventory list. This post contains advertising links which are marked with a * Complete inventory list for MoM 2nd Edition: Expansion Streets Of Arkham This list is a continuation of the list i made for the Core game of Mansion of Madness 2nd edition. As I felt i could not do the one without the other. So hopefully this will be just as big a success as the core game post. Review: Is My Little Pony: The Roleplaying game any good. My little pony roleplaying game. the game everyone needs to try. If you play roleplaying games. You need to try to play this. Have fun while doing it. This post contains advertising links which are marked with a * What is My little pony RPG. Complete inventory list for MoM 2nd Edition: Expansion Streets Of Arkham This post contains advertising links which are marked with a * This list is a continuation of the list i made for the Core game of Mansion of Madness 2nd edition. As I felt i could not do the one without the other. So hopefully this will be just as big a success as the core game post. What is a roleplaying game? This post contains advertising links which are marked with a * A roleplaying game is a game of your own fantasy, it can be a boardgame, it can be live action roleplaying. Mansion Of Madness 2nd edition: Beyond the Thresold Complete inventory list. Complete inventory list for MoM 2nd Edition: Expansion Beyond The Threshold This post contains advertising links which are marked with a * This list is a continuation of the list i made for the Core game of Mansion of Madness 2nd edition. As I felt i could not do the one without the other. So hopefully this will be just as big a success as the core game post. My Copenhagen System Open Writeup. Star Wars X-wing miniatures Copenhagen Regional Writeup. Ok, so i joined in on the Copenhagen Regional tournament. In Star wars x-wing miniature game. And i was thinking. Should i go for a top tier list. But then again I thought why not just make a fun list. And see what it can do. and so i did. With a scum list And this is my Regional story. The List Well first off i really screwed up when making my list, at least I feel like i screwed up but here is the List.